When Jeff Chang grew tired of having to choose between shopping for bargains or shopping for quality, he decided to spend his money in a different way. Chang invested in a sewing machine and began the journey to create the world’s first odor, liquid and stain-resistant chino pants with a lifetime quality and size guarantee. Using silver-infused fabric and water-repellant nano technology, Forever O.G. pants are guaranteed to outlast you for life. No questions asked. Prior to launching, the Wonderous team came to Enventys Partners with no pre-launch efforts and no campaign strategy. Starting a few days prior to the launch of their campaign, Enventys Partners helped the Wonderous team strategize and create a paid social media plan to maximize audience reach and build awareness. After evaluating the product and researching similar campaigns on Kickstarter, Enventys Partners was also able to craft a targeted media list and outreach campaign to secure coverage for Wonderous in online media outlets to boost momentum and funding. Enventys Partners solely focused on paid social media and public relations efforts to raise awareness for Wonderous’ crowdfunding campaign. The two teams worked together to maximize reach and help the campaign surpass its funding goal. During the first few days of the campaign, Enventys Partners tested over 20 different audiences with a moderate budget for initial A/B testing. By day 3, the team was able to find several audiences that had high conversion rates and a positive ROI. The daily budget for these audiences was then scaled up and the team maintained a consistent positive return throughout the campaign. The two slowest days of the campaign were due to a Facebook glitch that stopped Facebook ads from running for a total of 24 hours. You can see how the campaign was impacted. Funding was down 85% the day Facebook ads stopped running. The campaign’s success was its consistency. Its daily funding maintained at an average $7,000 without hitting a mid-campaign lull. The Forever O.G. 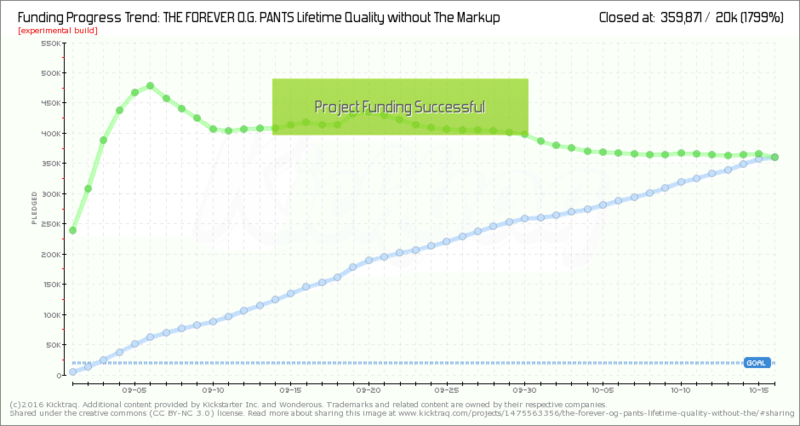 Pants crowdfunding campaign raised a total of $359,870, which was 1,799% of its original $20,000 funding goal, and the project stayed within the top 3 spots of the most popular fashion projects on Kickstarter for the life of the campaign. With Enventys Partners at their side, Wonderous took the team’s advice to implement stretch goals and flash sales, rearrange the campaign page layout, provide samples for the media and adjust Facebook advertising budgets accordingly. The Enventys Partners team was able to secure coverage for the campaign in Inside Hook, which raised $11,600 single-handedly, while the paid social media team was able to help raise $107,000 in revenue with 893 tracked conversions.